Michael Franti is one fierce yogi. A decade ago, the dynamically outspoken muscle behind hip hop’s eclectic Spearhead started the 911 Power To The Peaceful festival—a free park concert in his native San Francisco to raise political and social awareness through peaceful activism. That first attempt drew 6,000 people. It currently draws upwards of 60,000 and now features collective yoga practices for the masses before and after the music. Coinciding with this year’s 10th Annual event, his latest album hits stands this week. For All Rebel Rockers, Franti made a concerted effort to infuse vibrant, booty shakin’ beats in his mission to uplift people through dance, after he did just that during a visit to Iraq. Though images of him are often stern and militant, in the following conversation he is humble and poignantly expressive. 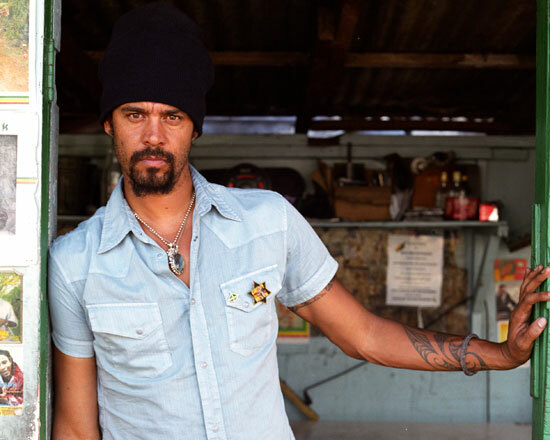 Preparing for PTTP and his upcoming performance in Santa Cruz on Sept. 18, Franti gives GT insights into the evolution of the festival and the protest icon’s music through his years of international experience. 911 Power To The Peaceful began as a movement to protest the death sentence of Mumia Abu-Jamal. Please talk about how the events of 2001 have transformed the festival name and purpose. When we first put on PTTP it was called Mumia 911 and we used the number 911 to draw attention to the emergency status of his case. Impending execution is an emergency and so we held it on September 11th. When the attacks occurred in 2001, people really wanted to make a statement that September 11th and the loss of life that occurred on that day should not be commemorated as a day to call for more war. It should be remembered as a day to end all political violence. As the festival has grown the theme is always music and action. Through music we want to bring people together, and through speakers and the hundreds of social organizations that are there we want to embrace consciousness and encourage people to take that consciousness and put it into action. Last year you took PTTP to São Paulo, Brazil. What led to that international expansion? Some people there had been to our festival and said, ‘We want to do this in São Paulo, but our situation here is different. Our people are not as concerned about international political violence. The situation in Sao Paulo is social violence between the rich and poor.’ So we put on a concert one day to raise money for many different social justice NGOs that teach music to kids, provide health care, dental screening, and eye care screening in the favelas [Brazilian shanty towns] that are in the poorest areas and provide kids an opportunity so that they don’t have to go into the drug trade, which is the biggest avenue for kids there. The second day we put on a free concert in the favela featuring ourselves and about nine different Brazilian bands. This coming February we’re doing a festival in Tanzania. Speaking of a show in a favela, you’ve performed for prison inmates, children in elementary schools, Native Americans at reservations, and soldiers in Iraq. What have you found unifies such contrasting groups? We played at San Quentin two years ago and there you have all these different groups in the yard with their own spots, and for the most part they don’t mix. There was one song that united the whole yard and had everybody with their arms around each other singing this one song. And that song was the theme to “Sesame Street.” It just shows how everybody has that child in them and that playfulness in them, and I think that’s what we all have in common. Music helps bring us into the moment because it helps us laugh, dance and smile. And when we see that in the eyes of other people, it stops thoughts like, ‘Oh, you’re a guard or a prisoner or a black or a Mexican or a Norteño or a Sureño.’ That’s why music is the universal language. I saw it really clearly when I played for Iraqi civilians and in the same day played for U.S. soldiers who were putting those civilians in hospitals. One night when we were in Iraq we had a party at which we were playing music, and there were Iraqis and U.S. soldiers who were together for the first time. When they were out on the streets they were adversaries but when they were at this party dancing to the music, they were together. It really restored my faith in music. Was that experience in Iraq what influenced you to make your upcoming album, ‘All Rebel Rockers,’ a more danceable, beat-oriented album? Absolutely. Wherever I would play music in the street in Iraq, people would dance, clap their hands, sing and shout. I remember one time I stopped and had a translator explain that I wanted to sing a song about war called ‘Bomb The World’ in which I sing, ‘We can bomb the world to pieces but we can’t bomb the world to peace.’ When I started singing the song I noticed the faces of the people just going, ‘Oh, whatever.’ Because they’re living this reality that I’m singing about, they were looking at me like they wanted me to play another one that got them up dancing. Rhythm is an international language, and that’s why I wanted to make it a record that people could dance to everywhere you go. It’s still inspired first by the words, melody and chords, but with a beat that people can rock out to. A fan gave your album ‘Yell Fire!’ to Barack Obama. What is your response to that and what are your thoughts on this monumental presidential election? I was thrilled … Touring in Europe I’ve asked several people, ‘What do you think about Obama?’ and their attitude has been, ‘He is so great for the world.’ I talked to someone in Belgium yesterday who said, ‘I can’t imagine people in other parts of the world burning effigies of Obama because he’s one of us.’ I’m realistic about presidential politics and I don’t expect a president to solve all of our problems overnight, and in terms of my own personal politics he’s much further to the center or to the right than I’ll ever be. But in terms of a 21st Century leader I think it’s remarkable to have someone who has a Muslim father, a Christian mother, an African father, and an Anglo-American mother. He’s from a broken home and he didn’t have everything handed to him on a silver platter, yet politically he became alive in mid-America where he had to learn to be a consensus builder. I really believe that today we’re not going to solve the world’s problems without the help of everyone; We need grassroots organizers to come up with the ideas, corporations to provide money, political leaders on the left and the right to get this world back on track. And it’s going to take the efforts of all 6.5 billion people—not just Barack Obama. Michael Franti &amp; Spearhead perform at 8 p.m. on Thursday, September 18 at The Catalyst, 1011 Pacific Ave., Santa Cruz, $29/adv, $34/door. 423-1338.